To use our ccw reciprocity map, simply select the state and whether your license (or license you intend to get) is a resident or nonresident license. The map will then display which states honor the license. State laws regarding concealed carry reciprocity vary between the various states, as does the criteria that each state uses to determine which state licenses it will reciprocate with. Some states will not reciprocate with any state that has licensing requirements less stringent than its own. Some states reciprocate with no licenses at all and some states reciprocate with all licenses. Some states decide on a case-by-case basis, and other states will only recognize licenses from states that recognize and reciprocate with their own. As for the licenses themselves, handgun permit policies are issued on a may-issue or shall-issue basis. The exception is the state of Vermont, which does not require any licensure for citizens to carry a handgun so long as they are legally entitled to do so. Non-residents are not required to have a license to carry. Vermont also doesn't recognize any concealed carry permits nor does Vermont issue any licenses. On that basis, Vermont neither reciprocates or is reciprocated with concerning concealed carry permits. 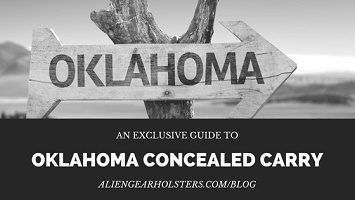 Both may-issue and shall-issue states have minimum concealed carry permit requirements. Exact legal requirements vary, but applicants are typically required to be legally permitted to have a handgun in the first place, such as having attained at least 21 years of age, haven't been convicted of a felony or violent misdemeanor and aren't fugitives from justice. There may be a training requirement, and all permits require a background check and fingerprinting. Additionally, a few states offer an enhanced concealed carry permit. These licenses typically require more extensive training than standard concealed carry permits and usually include a live fire component, though many training components for standard licenses do as well. Only a few states offer these licenses, but license holders typically enjoy greater reciprocity than standard licenses. In shall-issue states, an applicant will be issued the license if the state's requirements for a concealed carry permit are met. In some shall-issue states, however, law enforcement officials can deny a license application at their discretion, if they have probable cause to do so. In may-issue states, an applicant MAY be issued the permit if they meet the requirements; issuance is totally at the discretion of law enforcement. Licensure in may-issue states varies wildly. Connecticut is de jure may-issue, but is mostly shall issue with discretion for law enforcement in practice, as good cause must be shown to deny a permit. Rhode Island's permit policies are similar, as are those of Delaware. In California, however, issuance of a permit is totally at the discretion of the issuing authority. Issuing authorities in California are local law enforcement, and each takes their own approach in deciding whether to issue or not. Hawaii is technically may-issue at law but is, for all intents and purposes, no-issue in practice. Applicants must prove a need to carry and are subject to extreme scrutiny. Only a few licenses are issued in Hawaii per year. Additionally, some states will issue a concealed carry permit to non-residents. Often, non-resident permits will enjoy less reciprocity compared to resident licenses from the state that issued them. That said, many nonresident licenses are still very widely reciprocated with. Please bear in mind that nothing contained in this guide up to this point or after constitutes legal advice of any kind in any way, shape, nor form. If you are currently licensed in one state and wish to carry in another state, the onus is on you to do the appropriate research to find out what constitutes legally carrying in that state. Consult with an attorney if you want to find out more. Below, you can view reciprocity information for every American state. If you find any discrepancies within this reciprocity map, please send a private message to our Alien Gear Holsters Facebook Team. Thank you in advance! Further Relevant Information: Read more. Alabama concealed carry currently requires a permit. 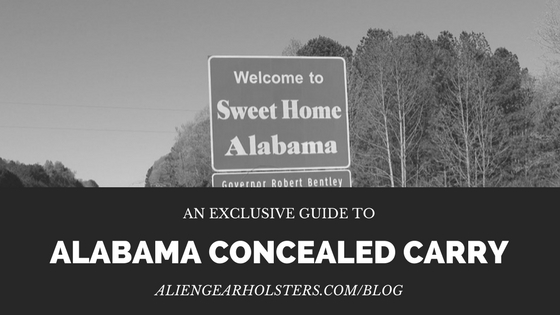 Senate Bill 24 was presented in early 2017, which would otherwise remove the need for a pistol permit and make Alabama the next constitutional carry state. However, as it stands, the state will require a relatively painless application, fee and background check. Alaska concealed carry licenses are not required, but the state does issue them and they are recognized in 38 states. 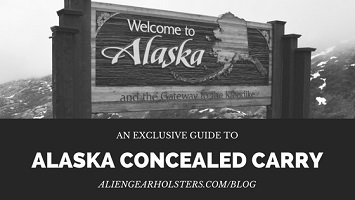 Therefore, if Alaskans at any point decide to travel outside their massive home state, which is as wide as the combined lower 48 states, they may face legal barriers for concealed carry without a valid permit. 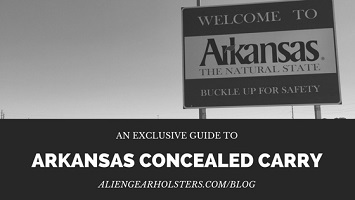 Although recent legislation has relaxed firearms laws within the state, Arkansas concealed carry currently requires a permit. The permit itself is valid for five years and is recognized by a majority of the U.S. The state has campus carry laws in effect and allows new residents to transfer a valid permit from the state they moved from once they've held a permanent residence in the state for about 90 days. 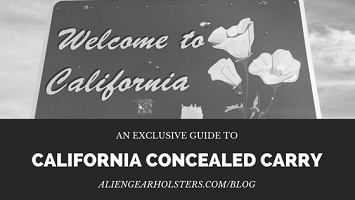 The process to apply for a California concealed carry permit, which is the only way for residents to legally carry concealed in the state, is subject to restrictive policy. The state’s issuing authorities, which are county sheriffs or chiefs of police, grant permits on a “may-issue” basis that is determined partially by what they determine to be moral character and good cause. 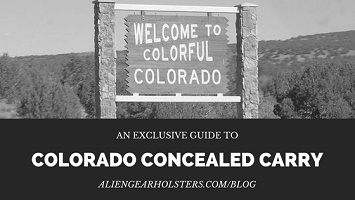 Colorado concealed carry regulations can be misconstrued on multiple levels if they aren’t seriously scrutinized by the individual gun owner. One example is the state’s legalization of recreational marijuana. Despite that law, permit applications require the applicant to not use controlled substances as per federal regulation, which recognizes marijuana as a schedule 1 controlled substance. The state’s reciprocity agreements are just as complex as the concealed handgun permit application process, which is the only way to guarantee the right to carry concealed firearms in most areas of the state. The application process for the Connecticut pistol permit is highly involved for both residents and nonresidents. 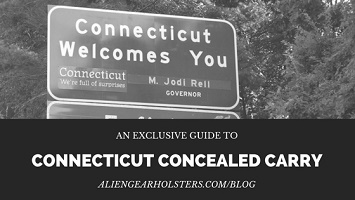 While important for anyone who wants to carry in the state, it’s especially poignant for nonresidents looking to legally carry their firearm in Connecticut. This state does not recognize permits from any other state. 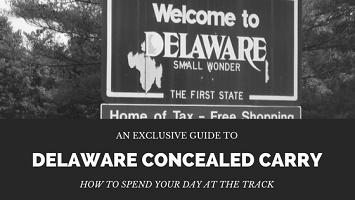 Concealed carry in Delaware is restricted unless the resident has a state license. Applying for that state license is a strict process that will require the applicant to publish their application and intent to concealed carry with a local newspaper within 10 days of filing the application for review by the attorney general's office. Visiting nonresidents must have a permit from their state, but may apply for a temporary 30-day permit under certain circumstances. Reciprocates With: Permits are honored for residents of AL, AK, AR, AZ, CO, DE, GA, ID, IA, IN, KS, KY, LA, MI, ME, MO, MS, MT, NE, NH, NM, NC, ND, OH, OK, PA, SC, SD, TN, TX, UT, VA, VT, WV, WY. Non-resident permits are not honored by FL. 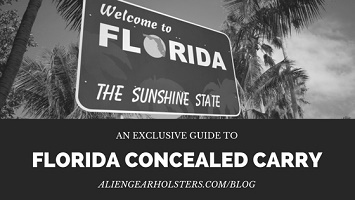 Florida boasts the largest number of issued concealed carry licenses in the United States. Their licensing system is streamlined and there are stand your ground laws in the state. There are about 15 identified locations within the state that prohibit firearms on the premises. 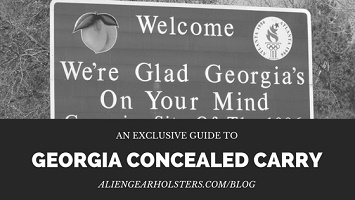 A Georgia weapons carry license is a necessary step to take for open or concealed carry in public. However, as with any other state in the union, there are restrictions on when and where carrying a firearm is allowed and who is using it for what reason. 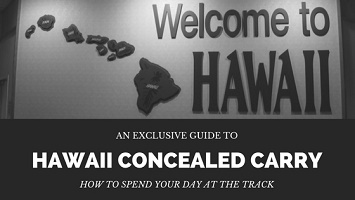 The Hawaii concealed carry permit exists, technically. The applicant will face one of the most strict permitting systems in the U.S. The permit to acquire handguns in the state is a more popular option, and it allows for carrying in one's residence, business or place of sojourn in their respective county. 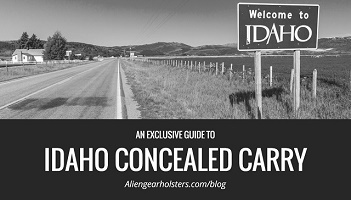 The constitutional carry provisions only extend that privilege to Idaho residents. Residents of other states will still need a permit, so long as the state of Idaho recognizes or reciprocates with the permit that a person is carrying. 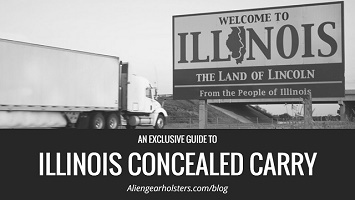 Illinois was the last state to have laws in the books barring concealed carry weapons. After failing to provide more than a simply rational basis for the public safety afforded by its sweeping ban, the Seventh Circuit reversed those laws, but allowed 180 days for legislature to draft new restrictions. Indiana concealed carry currently requires a state-issued permit. Applying for one is a three-step process with fingerprinting, state and local fees. The state allows those with civil protection orders to carry without a license for 60 days after the order is issued. In early 2017, Republican leadership in Iowa updated a large portion of the state’s deadly weapons laws. These expanded stand your ground laws and prevented local governments from regulating firearms. Initially, the permit and background check systems were on the chopping block, but those measures were not included in House File 517. Permits are currently still a requirement. In 2015, Kansas gun laws were altered to allow concealed carry without a permit for residents and nonresidents alike. 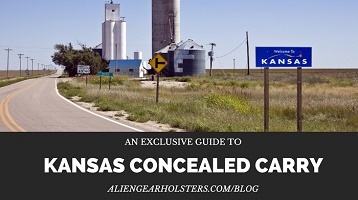 The permit program started under the Kansas Personal and Family Protection Act is still in effect for residents who would like to benefit from the added freedoms the permit provides, as well as to travel to other states with their concealed carry weapon. However, applying for one of these permits will require an eight hour training course and an extensive background check, not to mention processing fees. 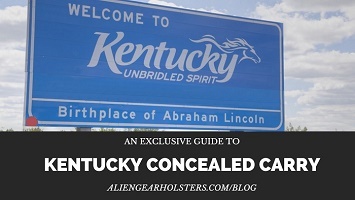 Although this state has fairly relaxed gun laws, allowing open carry without a license in most places throughout the state, Kentucky concealed carry laws at the moment do require a CCDW license to carry concealed weapons. There are restrictions on who may receive the five-year permit, however. 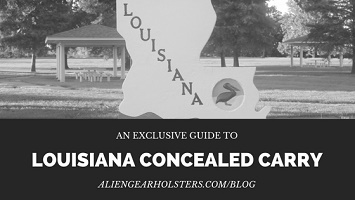 According to Louisiana gun laws, a concealed carry permit shall be issued to an applicant if they meet all the required criteria and submit all the correct documentation. Carrying a concealed weapon is only an option if one has that permit, and it’s only distributed to Louisiana residents. However, Louisiana shares reciprocity with all other states that recognize its own permit. 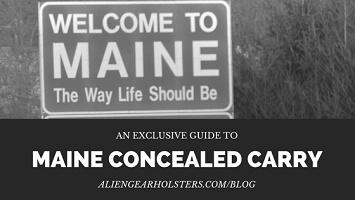 Reciprocates With: Maine is a constitutional carry state for residents and non-residents alike, so no permit is needed. However, Maine maintains reciprocity with AK, GA, KY, MI, NE, NH, OK, and UT. In 2015, Maine removed its concealed carry carry permit requirement after passing LD 652 into law, a bill introduced by a first-term senator. Those over the age of 21, and 18 to 20 year olds who are either active duty U.S. Armed Forces or honorably discharged, who are otherwise not prohibited from possessing a firearm may carry throughout the state without a permit. There are, however, still location restrictions and Maine residents traveling outside the state will need to follow the respective state’s various firearms laws, including its permit system. 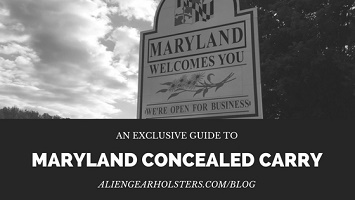 Within the U.S., Maryland concealed carry laws are some of the most complicated and restrictive. As a may-issue state, it’s up to the licensing authorities to determine whether the applicant is qualified to own a wear and carry permit. Applicants are required to show good and substantial reason with a valid argument supported by documentation and evidence. Beyond that, however, there are several more requirements within the application process, which is the only way for residents to legally carry within the state. It also does not recognize out of state permits. 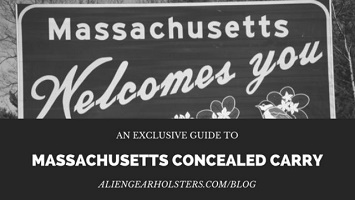 Concealed carry in Massachusetts is heavily regulated. It’s only accessible for those with the appropriate licensing. Getting the license is a battle in its own right.There are two different categories for firearms licenses in Massachusetts: a firearms identification card (FID) and a license to carry (LTC). Prior to 2000, Michigan concealed carry permits were issued by county gun boards, typically on the basis of need. However, in 2001, Michigan’s Public Act 381 opened up concealed carry rights to anyone who met the state’s intense restrictions on receiving a permit. 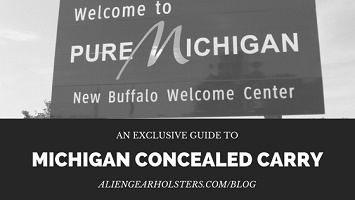 Michigan legislature controls who gets to concealed carry within the state, where within the state and to a certain degree how a gun is concealed carry in the state. 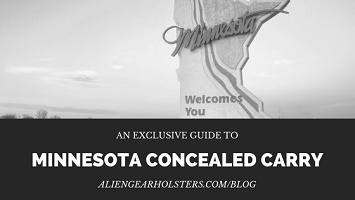 Minnesota concealed carry is a structured system of statutes and substatutes generated from the Minnesota Personal Protection Act. 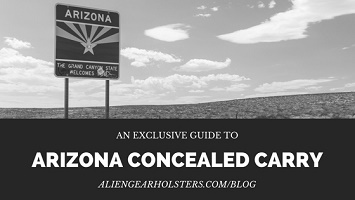 The permit to carry system established in 2003 covers both concealed and open carry, but there are exceptions as to where a firearm may be taken in the state and who may carry it when, why and how. 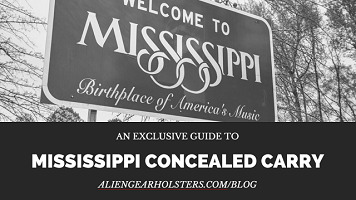 As of April 2016, there is a limited Mississippi constitutional carry law in effect, as all but a few restrictions have been lifted regarding carrying without a permit. However, the restrictions are such that a resident may want to consider the permit in any case. 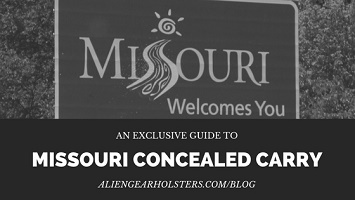 Missouri concealed carry laws implemented constitutional carry measures in the beginning of 2017 after the state's house and senate voted to override the governor's veto on Senate Bill 656. Although there are 17 locations throughout the state where concealed carry is restricted, restrictions have been given some breathing room. There is also a permitting system so residents may legally travel out of state and carry their firearms. 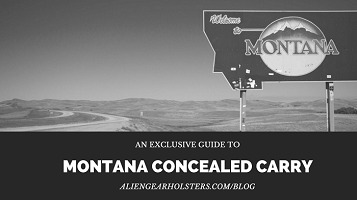 Montana generally requires a permit in order to carry a concealed weapon. However, Montana gun laws allow a weapon to be carried concealed without a permit at certain locations beyond one’s home, business and vehicle. 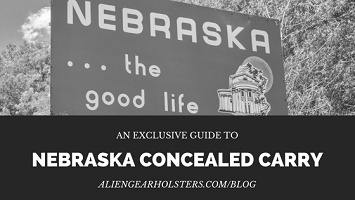 Concealed carry in Nebraska is currently only an option with a permit, but there are exceptions for those qualifying under certain law enforcement standards. Nebraska is a “shall issue” state and will grant the qualifying applicant’s five year permit within 45 days. Understanding how to apply is one of the few barriers holding the law abiding gun owner back from everyday concealed carry in this state. 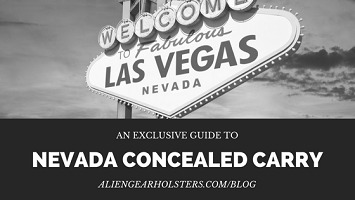 Nevada concealed carry laws should be a point of interest for any Nevadan gun owner, but especially so for a state that, according to the Nevada Division of Tourism, has $17.7 billion of its gross domestic product stemming from the Nevada travel industry. People come to the state. Those people might have weapons. People live in the state. Those people might also have weapons. Those looking to be one of those two gun-owning demographics should know how, when and where concealed carry works in Nevada. 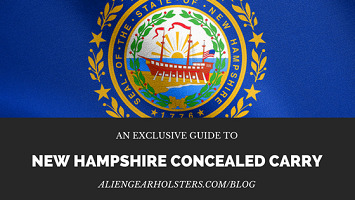 In February of 2017, Governor Chris Sununu signed Senate Bill 12 into effect, changing New Hampshire concealed carry laws to remove the need for residents and nonresidents to have a CCW permit in the state. The permit is still used, however, to honor reciprocity agreements with other states New Hampshire residents may be traveling to. 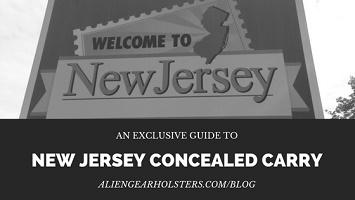 New Jersey concealed carry laws are some of the most restrictive in the nation. The may-issue permit system requires demonstration of training, show of legitimate justifiable need, proof the applicant is of good character, three character references, fingerprinting, various fees and more. 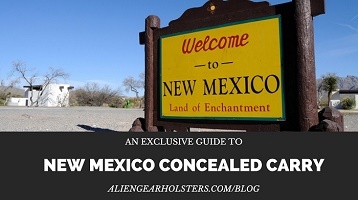 In order to carry a concealed handgun in this state, one will need a New Mexico concealed handgun license, or one from a state recognized by New Mexico. However, there are a few exceptions for New Mexicans on their own property, for those who are in private vehicles, for peace officers in accordance with their law enforcement agency policies, and in general when the CCW is unloaded. 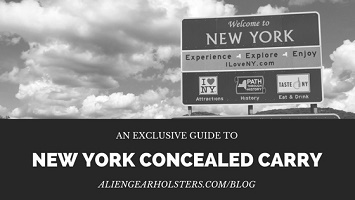 New York concealed carry laws are some of the most restrictive within the nation. There are state, county, local and departmental statute throughout the state that govern who may carry when, where and why. This may-issue state does not recognize out of state permits and has several types of firearms licenses for state residents and qualifying non-residents. 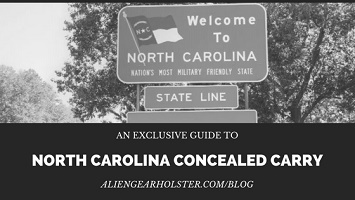 North Carolina concealed carry is a heavy-handed approach to applying the background check to all elements of owning, purchasing and carrying a handgun within the state. Even private sales, like with gun shows, outside federally licensed facilities are filtered by a permit requirement. 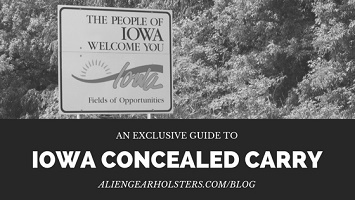 Knowing when the permit is applicable, why, how to get one, and what its role is in concealed carry is the first step to everyday carry in this state. 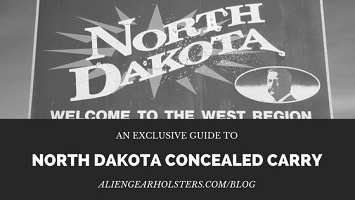 North Dakota concealed carry reciprocity will be a deciding factor for those residents applying for either a Class 1 or Class 2 concealed weapons license, due to the fact that the primary difference between the two is increased reciprocity, given the Class 1 license’s more rigorous training standards. Reciprocity agreements will also dictate which nonresidents may apply for a North Dakota concealed weapons license. Ohio concealed carry became a reality in 2004 after it became the 46th state to institute a concealed handgun license program. After a recent reciprocity update, 40 states recognize an Ohio CHL. 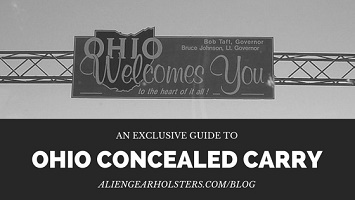 Despite limitations and an application process similar to other states that regulate CCWs, Ohio breaks from the herd and affords residents the opportunity to apply for an emergency concealed handgun license if in imminent, perceivable danger. Oklahoma concealed carry will require a handgun license issued under the state’s Self Defense Act. The licensing process, with the right approach and background, is a breeze. The state offers a license that’s valid for 10 years and recognizes valid permits and permitless gun laws from all other states. 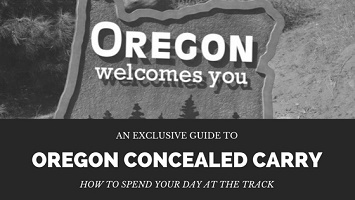 Concealed carry in Oregon is only an option for state residents with a permit. Oregon currently does not recognize out-of-state permits, and offers nonresident permits to residents of bordering states when they have demonstrable need. The state permit has an initial fee of $65 and will require handgun training. 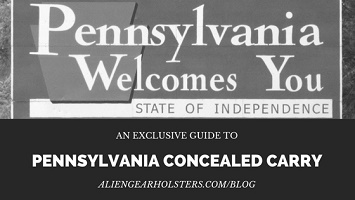 Pennsylvania concealed carry laws require a permit in order to carry in the state. While the application process is relatively painless, especially considering it doesn’t necessarily require a handgun training course, there is an important qualifier that will restrict candidates, which is an interview to determine their “character and reputation.” Beyond that, it’s a “shall issue” state. 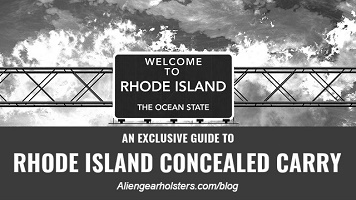 Only a few states in New England are known for making it easy on concealed carriers, but Rhode Island concealed carry has become much easier in recent years. This is largely thanks to a court case that altered the licensing protocol. 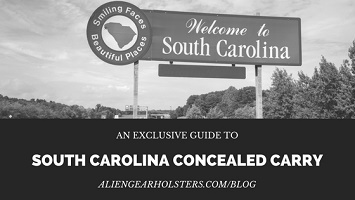 According to state reports from 2015, the number of South Carolina concealed weapons permits ballooned to more than 276,000 that year. The state has reciprocity agreements with 22 states. Along with multiple location restrictions through the state, businesses may prohibit firearms on the premises with appropriate and legal signage. The application process, albeit daunting, is fairly straightforward and has exceptions for military and law enforcement members, both active and retired. Reciprocates With: All state permits so long as they conform to South Dakota's permit requirements, which consists of a background check - thus, all state-issued permits are recognized. 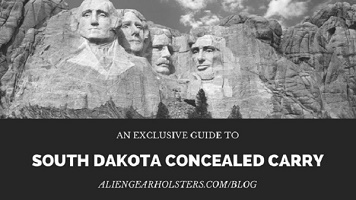 Although open carry in the state is legally allowed without any type of permit, South Dakota concealed carry is accessible only through one of the state’s three types of CCW permits. The regular permit is the cheapest to obtain, but is recognized by fewer states in comparison to the other two -- the gold card permit and the enhanced permit. Nonresident Permits? If employed in TN on a "regular basis"
Tennessee concealed carry has been altered in the wake of recently passed laws and regulations. Sometimes figuring out concealed carry best practices starts with understanding where to even begin. 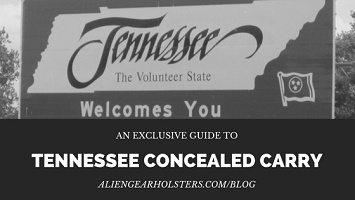 The Tennessee handgun permit allows for both open and concealed carry, is recognized by nearly 40 states and has a straightforward application process. 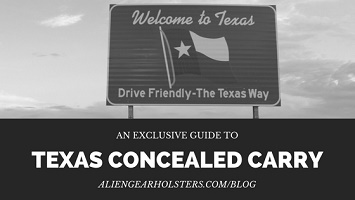 Concealed carry in Texas is constantly being improved through legislation, efforts from gun rights advocates and a staunch respect for the Second Amendment. That being said, with laws changing and bills being introduced it’s every gun owner’s responsibility to constantly be up to date on their consistently shifting requirements and responsibilities. Building a solid foundational knowledge is the first step to understanding how to carry concealed in Texas and for self-defense as a whole. 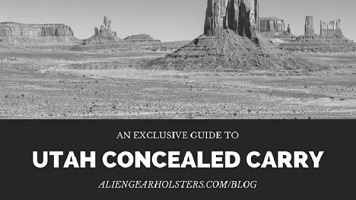 Concealed carry in Utah is regulated with the intention of keeping civilians safe. This means a permit is a necessary evil. However, it’s broadly owned by many folks, especially non-residents, given that in late 2016 nearly two-thirds of all Utah permits were owned by those residing out of state. 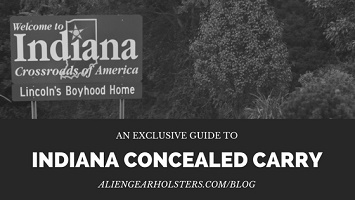 There is little barrier to entry when it comes to concealed carry in this state, but there are a few things to know before jumping in head first. There is no Vermont concealed carry reciprocity. 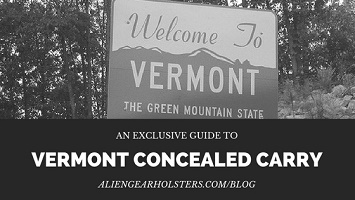 Vermont is a constitutional carry/permitless carry state and thus any resident or nonresident can carry, openly or concealed, without a permit. A person merely needs to to be legally able to possess a firearm. Thus, no permit is needed for nonresidents or travelers to carry in Vermont. Since the state does not issue a permit to residents or nonresidents, there is no Vermont license for other states to recognize or reciprocate with. Vermont residents can, however, obtain a permit from a state that issues nonresident permits if they wish to carry outside Vermont. Vermont concealed carry laws for nearly a century were the only in the U.S. that explicitly allowed carrying concealed weapons without first applying for a permit. This was affirmed in the courts in the 1903 case State v. Rosenthal. This state tends to be celebrated in gun-rights groups who push for constitutional carry. 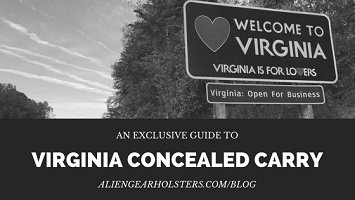 Virginia concealed carry is highly accessible to those looking for a hard line of self-defense. The state’s reciprocity agreements cover a majority of the U.S. The required handgun competency coursework can be taken online. There are few barriers to entry when it comes to legally exercising Second Amendment rights in the Commonwealth. 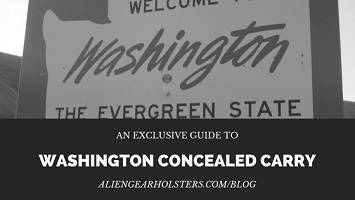 Washington state is potentially in a place of high legislative volatility, given the attorney general, Bob Ferguson, recently released a white paper outlining 13 recommendations on altering statutes and procedures surrounding access to firearms. 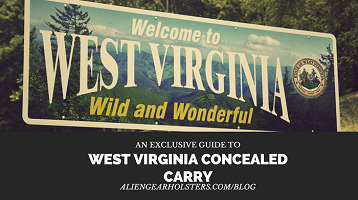 West Virginia concealed carry no longer requires residents and nonresidents to have a permit, with certain restrictions. That said, residents may apply for one of two types of permits to receive various benefits. The optional CHL is for those at least 21 years old and it offers reciprocity benefits, as well as a few additional perks. The provisional CHL is for 18-21 years old, as they do not qualify under West Virginia’s constitutional carry age requirement. 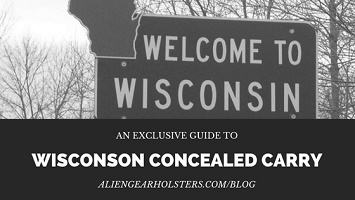 Wisconsin concealed carry, as with many other states, is bound to a licensing program, which is only available for residents that qualify under certain requirements established and enforced by the Wisconsin Department of Justice. There is a training component required for the initial permit application, but not for renewals. It shares reciprocity with states that share similar licensing requirements. 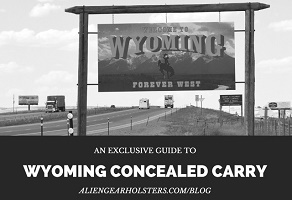 No permit, no problem -- legislators changed Wyoming concealed carry laws to remove the need for state residents to jump through legal hoops in order to practice Second Amendment rights, meaning less control and more carrying.